Sunflowers seem to be a good transition from Summer to Fall. While I have not pulled out all of my sweaters yet - I feel fall is right around the corner. There are hints of fall all around us like the start of football season, mums blooming, and Halloween candy in the stores! I love fall but I don't want to decorate for fall when it is still so warm outside, hence the choice of Sunflowers. 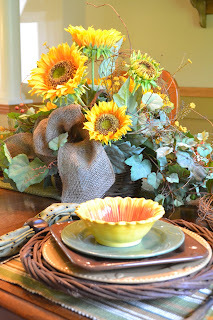 I found these cute sunflower bowls at my first trip to an Old Time Pottery, and it definitely will not be my last! The chargers are from Pottery Barn, I found them on sale while I was in Denver with my sister. This meant carrying them back with me on the plane, but it was well worth it! I made the napkins from a Debbie Mumm print I had in my stash down the basement. I used my round brown Sorrento salad plates to hold my candles. I put some grapevines around the edge and filled in the base with unpopped popcorn, trying to stick with a more natural look. I found these amber glasses at World Market this morning for 50% off, meant to be!! Someday I need to upgrade my flatware!! I would love something with a wood handle, maybe I will add that to my wish list!! I hope your days are sunny!! Thanks for stopping by. So happy to have you at Seasonal Sundays. 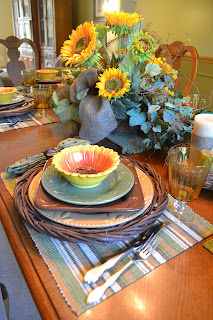 I did a sunflower table this week too! It just seems to be that time of year. Football and sunflowers ... Autumn must be just around the corner! Your tablescape is a lot of fun. Love the use of sunflowers. Happy Seasonal Sundays! 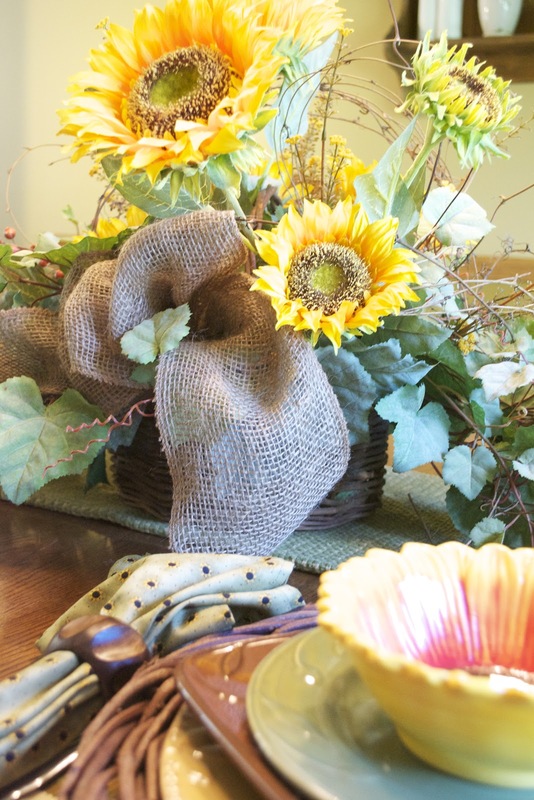 Yes, sunflowers are a great transition from Summer to Fall. I have used some of them throughout my decor. Love your bowls and chargers. The entire tablescape is lovely. Now a new follower. How lovely to view your beautiful sunflower tablescape! I like the idea of transitioning into fall for it is still warm almost hot in the low 90's. 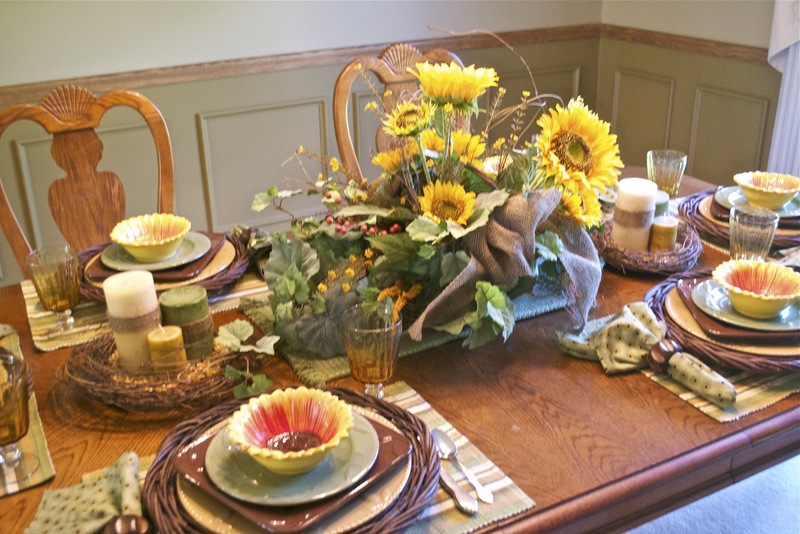 The lovely centerpiece with the natural elements and the sunny sunflowers makes the table so perfect for the season. I'm glad you brought the table accessories back on the plane especially the chargers. 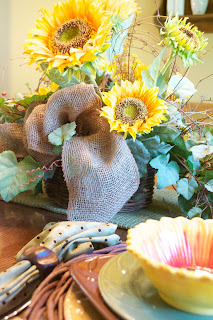 Thanks for visiting my blog and we were on the same wave link with the sunflowers! Nice mixture of texures and excellent layering of dishes very nice.